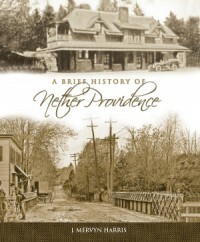 The library had for its foundation the School District of the Township of Nether Providence. In the year 1902 the School Directors concluded that the old Union School Building (4) on Brookhaven Road, was not sufficient for the then population, should not be enlarged, could not be furnished with modern necessities and that the size of the lot and location would not warrant the destruction of the building and the erection of a new building thereon. The directors therefore selected the present site on the Providence Road South from the railroad and had erected a four school-room stone building (5) with smaller rooms and all modern improvements and conveniences and Media water. I was a member of the Board and Treasurer. I informed the other members that my commission on the site and building would be for the establishment of a free library in the building. My co-directors became enthused and a room about twelve feet square was set aside for that purpose. All agreed that the library should be named for the outstanding scholar and author of Wallingford, Horace Howard Furness (6), an I was delegated to get his consent. Dr. Furness did not desire the compliment but stated that he would contribute $100 (7) and asked that it be named in memory of his wife Helen Kate Furness (8). I returned later and told him that all were reminded of his standing as a distinguished scholar, and more strongly reminded him of how when we were young we used his property (9) for a playground, and particularly his lawn and mystic maize puzzle during the winter when he and his family were in Philadelphia , and further that we would adopt his name with the agreement that he would not contribute to the operation expenses, Dr. Furness finally consented. The school building being completed a charter for the corporation was obtained in our court on November 17, 1902. All meetings were held at the residence of Thomas Palmer at Palmer’s Corner and on October 21, 1902 an organization meeting was held there, a Constitution and By-Laws adopted and the following officers and directors elected, Horace Jayne (10), President; Mary E. Doak, Secretary; Alexander B. Geary, Treasurer; and Susanna W. Hoopes, Rufus M. Ingram, Emma B. Palmer, Everett Stewart, Anne Montgomery and Andrew L. Palmer, Directors. A fine library was installed and the pupils and older residents shared its value. 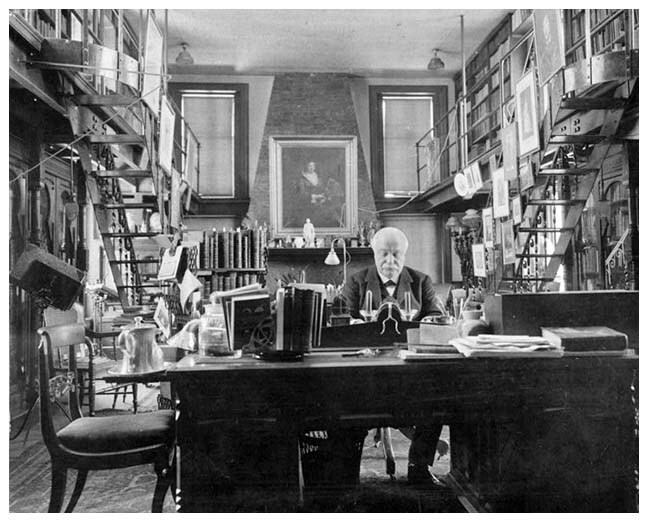 Liberal contributions were made by patrons and residents and the library continued in the school until 1916, when Dr. Furness passed away and his will set forth a bequest of $5000 (11) to the library upon condition that the name be changed to that of his beloved wife Helen Kate Furness. While all revered the memory of Dr. Furness it was pointed out that the framed charter contained his name and an amendment would show his interest in the community and the love for his wife. The directors immediately passed a resolution authorizing the change in name and stipulating that the bequest should be used only to erect a library building. The amendment was made and the decree is framed and hanging in the library. Dr. Horace Howard Furness, Jr. (12) had bequeathed an unrestricted legacy of $1000 to the library. Dr. William Henry Furness, 3rd (13), presented and conveyed to the Library the acre of land upon which the building stands with the provision that if it ever failed to be used for library purposes, it should revert to him and his heirs. Robert G. Holland, architect, a graduate of our schools and a resident of the township was engaged and prepared the plans and specifications and superintended the erection of the building, which has been pronounced by federal representatives to be one of the most attractive in the country. The building with conveniences cost more than $5000 and therefore part of the legacy of Dr. Horace Howard Furness, Jr. for $1000 was appropriated and the balance used to purchase books. Large annual contributions were required and the people responded graciously. The year 1928 is a good illustration. Dr. William Henry Furness, 3rd had passed away, bequeathing $3000 (14) to the library. The board made that a trust fund with the Land Title and Trust Company. In 1928, there was received from the fund $177, a special contribution for repairs to the heater $168.75 and contributions: 7 of $50 each; 6 of $25 each; 9 of $10; 8 of $5; 1 of $4; 1 of $3; 3 of $2; and 4 of $1 making, with a small balance from 1927, a total of $1013.62. The expenses were: Coal $14.75, Librarian 13 months $325, Janitor $120, repairs to heater $168.75. The contributions for other years were sometimes less but sufficient to meet all obligations and to enable the purchase of books. During the winter months well attended free lectures were given in the library. Professor Green of West Chester and others responded without compensation and of our local talent Mrs. Harry H. Pierson entertained, her subject being Cloisonne. I was active in the library and discovered that the directors hesitated to act without first obtaining my approval. That was not to the best interests of the library and I concluded that I should resign and thus let the directors act on their collective judgment, and did so in 1940. It proved to be well for the library in view of the fine results. The officers and directors as shown by the article in the Chester Times, are capable and enthusiastic and doing a good job. I am confident that a written call upon residents for contributions will bring a prompt and generous response which will exceed that of 1928. Alexander Brooke Geary (1870 – 1952) was a lawyer with offices in the city of Chester. He was born in Nether Providence Township and educated in the Township’s public schools until he was 14 years old. He worked on a farm until he was seventeen and then in the Baldwin Locomotive Works until he entered the law office of Oliver B. Dickenson of Chester in 1892. He was admitted to the bar of Delaware County in 1894. Soon after, he opened his own general practice law office. He was a member of the Philadelphia bar, the Supreme and Superior Courts of Pennsylvania and the United States Courts for the Eastern District of Pennsylvania. He was elected school director for Nether Providence Township in 1899 and served for three years. A 1914 biography describes him as “the moving spirit in the organization of” the Furness Library. A democrat, Mr. Geary was elected county solicitor in January 1909. He focused attention on the salaries of County officials, insisting that they not be paid more than the law prescribed, thereby saving tax money. This raised the ire of the County bosses who brought pressure to bear upon the County Commissioners to dismiss Geary from office at the end of the year. Mr. Geary’s parents were George Geary, born 1827 in Philadelphia, and Susannah Armstrong, a native of Ireland. George Geary was a farm laborer and worked in an axe factory. He purchased property in Nether Providence in 1868 and lived there until his death. George and Susannah Geary had twelve children. WPWA originated in 1946. The call letters stand for Philadelphia Wilmington Area. In it’s early days the Station’s studios and offices were in a building located on the west side of Edgemont Ave, across from the Brookhaven Shopping Center. There were three broadcasting towers located in the field behind the station. Next to the building was a paved area were the kids would gather and dance. After the Station moved to Aston, the building was torn down and replaced by a Roy Rogers Restaurant. It later became a Hardees, then a Boston Market, and, most recently, a Wendy’s. (http://www.oldchesterpa.com/wpwa.htm) Currently, WPWA (1590 AM) broadcasts a Spanish religious format. (http://en.wikipedia.org/wiki/WPWA). The Chester Times was first published in September 1876. In 1959, the name of the paper was changed to the Delaware County Daily Times (http://www.oldchesterpa.com/chester_times.htm). Dr. Horace Howard Furness (1833 –1912) [pronounced “furnace”] was the most important American Shakespeare scholar of the 19th century. As editor of the “New Variorum” editions of Shakespeare – also called the “Furness Variorum” – he collected in a single source 300 years of references, antecedent works, influences and commentaries. He devoted more than 40 years to the series, completing the annotation of 15 plays. Helen Kate Furness (1837-1883) was also a Shakespeare scholar. She authored A Concordance to Shakespeare’s Poems in 1874. The Furnesses’ summer estate, Lindenshade, encompassed 67 acres, including the neighborhood known today as Heatherwold. Dr. Furness’ brother, Frank Furness, designed the main house and its dependencies, which were located near the intersection of the current Furness and Lindenshade Lanes. Built around 1873, the house was demolished in 1940. The only buildings still standing are Dr. Furness’ private library and the servant’s quarters. Also on the estate property were the homes of several Furness family members. Horace Jayne was a grandson of Dr. and Mrs. Furness; son of their daughter Caroline Augusta Furness (1873 – 1909) who married Horace Fort Jayne. Horace Howard Furness, Jr. (1865-1930), the second of the Furnesses’ three sons, was a co-editor of the later volumes of Dr. Furness’ Variorum, and continued the project after the father’s death, annotating 5 additional plays. Dr. William Henry Furness was the Furnesses’ third son. Author of the book Folk-lore in Borneo, Dr. Furness became interested in the study of chimpanzees and orangutans, keeping a chimpanzee (and possibly an orangutan) at his Wallingford home. The trained and fully dressed chimp would accompany Dr. Furness in his errands around town. Dr. Furness’ observations on Chimpanzee and Orangutan mentality were recorded in the Proceedings of the American Philosophical Society in 1916 (Vol. 55, No. 3, p. 281). 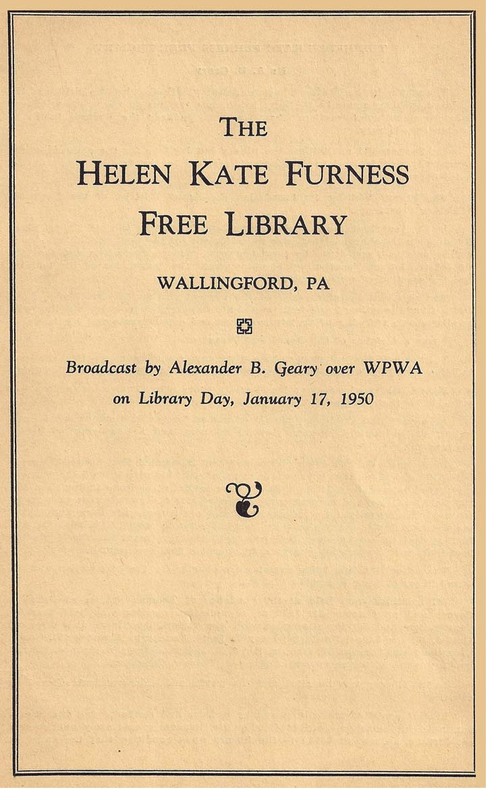 The Helen Kate Furness Library’s recent circulation was more than 70,000. The Library’s current collection is greater than 40,000 items.